The second starting day of the 2018 World Series of Poker $10,000 Main Event not only surpassed the field size of the previous starting flight but more than doubled the numbers of Day 1a, with a total of 2,378 entries. After five levels of two hours each, 1,794 players bagged up. They will return in two days time, on Thursday, July 5, for Day 2. At least two players bagged more than six times the starting stack in France's Smain Mamouni (311,600) and Samuel Bernabeu (309,500). Bernabeu consistently built his stack in the Brasilia room while Mamouni only appeared on the radar in the last hands of the night when his flopped nut flush draw got there against two players with sets to jump into the role of big stack. However, much of the media spotlight will be on Alex Foxen. After an incredibly hot run over the last two years, and some controversy this summer, it was no surprise to see Foxen once again among the big stacks with a very healthy 242,300. 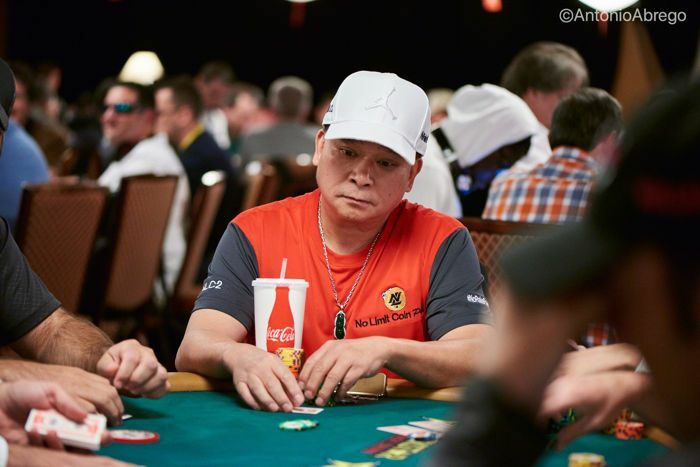 Poker legend Johnny Chan was another player to take part on Day 1b, and the 10-time WSOP bracelet winner and two-time Main Event champion nearly doubled his stack early on before smoothly navigating through the five levels of the day and ending up with a stack of 151,100. Other notables that made it through with plenty of chips include Rifat Palevic (185,800), 2014 WSOP APAC Main Event champion Scott Davies (171,200), Michael "The Grinder" Mizrachi (166,200), Pablo Fernandez (160,100), Pierre Neuville (147,500), Shaun Deeb (143,300), and Chris Ferguson (134,900). A face that had not been seen in Las Vegas and on the poker tables as of late was George Danzer. After becoming a dad, the mixed game specialist from Germany returned to Sin City for his first and only tournament of the summer and made it through with 117,800. Calvin Anderson came in fresh off winning his second career bracelet in Event #56: $10,000 Razz Championship and ended Day 1b with an above-average stack of 99,100. 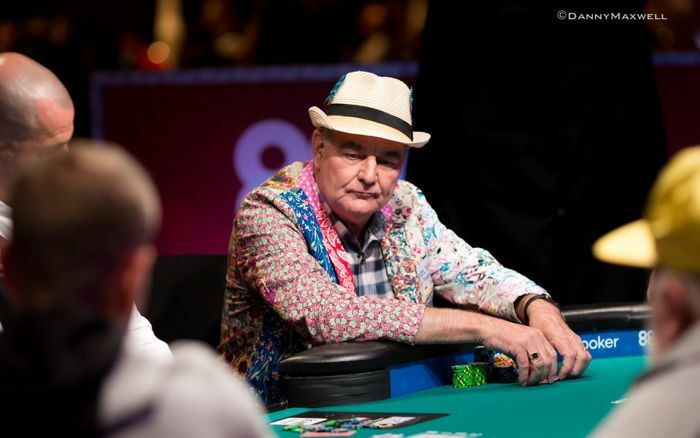 It all kicked off at 11 a.m. local time with a motivational shuffle up and deal by John Hesp, who gained a lot of attention for his very positive attitude during his deep run in the 2017 WSOP Main Event. He was welcomed by a lot of applause in the Amazon room before cards got in the air. Hesp was over on the ESPN feature table for more than one full level and went on to bag 63,900 for Day 2. 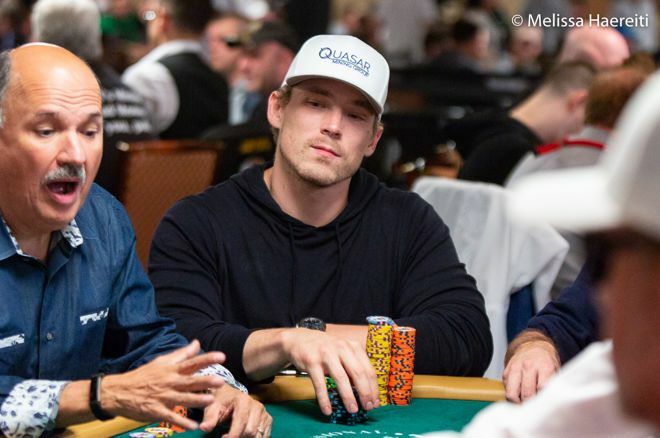 Among the notables to fall short of making a deep run, having to settle for an early exit instead were Noah Schwartz, Kenny Hallaert, Jesper Hougaard, the two former WSOP Main Event champions Jamie Gold and Greg Raymer, Justin Liberto, Doug Polk, Jason Somerville, Mickey Craft, Anton Morgenstern and Brandon Wong. Hallaert had a day to forget and eventually busted on the feature table in level three after he turned top two pair only to run into a flopped set of eights. For Max Steinberg, the day was already long over by then. In one of the very first hands of the day, Steinberg got his entire stack in with pocket aces against the pocket kings of Michael Rack. A king appeared right in the window and Steinberg became the first casualty of the day. Rack couldn't hold onto the chips, though, and busted towards the end of the day as well. The chips were going in left and right and pots were traded in three different areas in the convention center of the Rio All-Suites Hotel and Casino with the Amazon, Brasilia and Pavilion rooms in use. That's just a sign of things to come, though, with tomorrow's Day 1c usually being traditionally the strongest of the three starting days. This year, the final starting day falls on the July 4th Independence Day, and this may slightly lower the turnout for the final flight. The $10,000 Main Event is off to a great start, however. In 2017, Day 1a attracted a field of 795 entries (925 in 2018), and Day 1b gathered 2,164 poker enthusiasts one year ago. With Day 1b's entries, the total after two of the three starting flights adds up to 3,303 entrants, and more than 2,500 players have secured their seat for Day 2 already. The PokerNews live reporting team will once again be on the floor to bring you all the action from the most important poker tournament of the year, so make sure to tune back in and follow along with the madness to come. All the 2018 WSOP Live Updates van be found in the PokerNews Live Reporting hub.